Turf has it's place in the landscape. It's a great surface for recreation and it also acts as a filter for pollutants. There are several choices available to us in southern California. Cool season grasses - These grasses stay green in the winter, but require more water during our dry summer to maintain their appearance. Warm season grasses - These grasses stay green during the summer with little water, but turn brown in the winter when the temperature drops. These low-water use turfs and turf alternatives are being grown successfully at South Coast Research and Extension Center in Irvine. UC Verde Buffalo grass - This hybrid was developed at UC Davis. 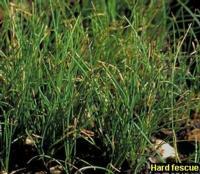 It is a fine bladed grass that looks similar to a hybrid bermuda, but it does not spread by underground runners. The ideal planting time is in the spring. Seashore paspallum, Platinum paspallum - Seashore paspallum is noted for its high salt tolerance. Platinum paspallum has a shorter winter dormancy period than bermuda grass. Kurapia - This clover-like ground cover spreads out from stolons to produce a thick mat which is covered with small sterile flowers for much of the year. It can be easily trimmed with a string trimmer. The flowers do attract bees. The maximum height of kurapia is approximately six inches.